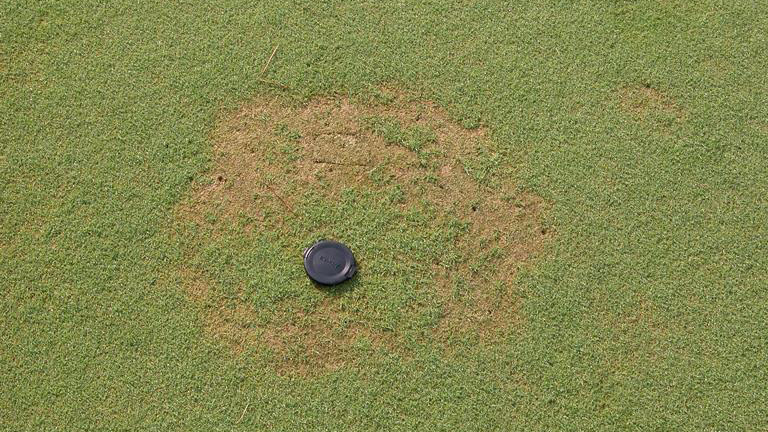 Pythium root dysfunction is a disease of creeping bentgrass putting greens, and is most damaging to greens that were constructed within the last 10 years. The pathogen infects bentgrass roots during the fall and spring and reduces their ability to absorb water and nutrients from the soil. Symptoms may appear at any time of year, but are most severe during periods of hot and/or dry weather. 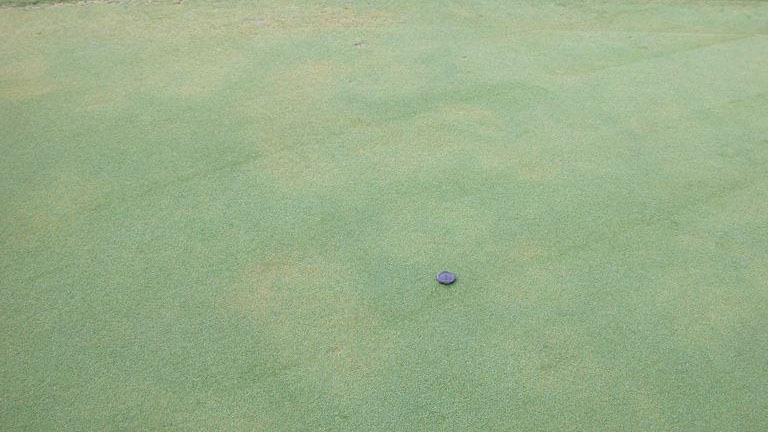 Pythium root dysfunction appears in circles or irregular patches up to 2 feet in diameter that initially show signs of wilt or nutrient deficiency. As the disease progresses, affected areas turn orange and decline, eventually collapsing to the ground. Infected roots are tan in color and lack root hairs, which causes the sand to fall easily from the roots when examining a soil probe sample. 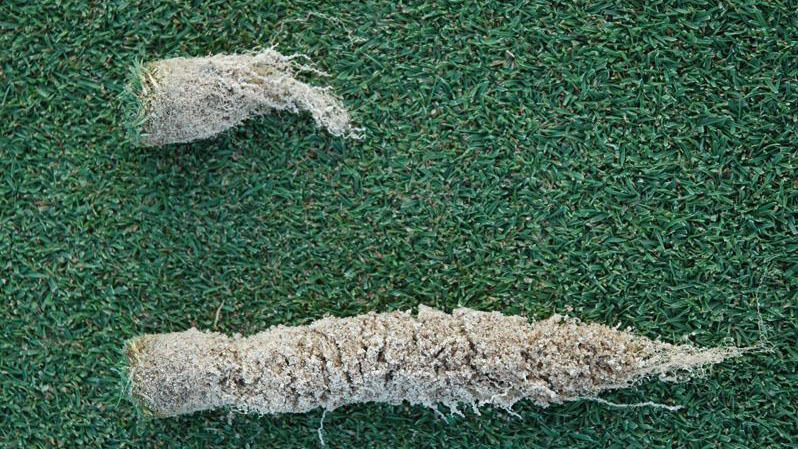 Reductions in root depth may not be evident during the fall and spring, but roots infested with Pythium volutum die back rapidly when soil temperatures are above 85ºF. 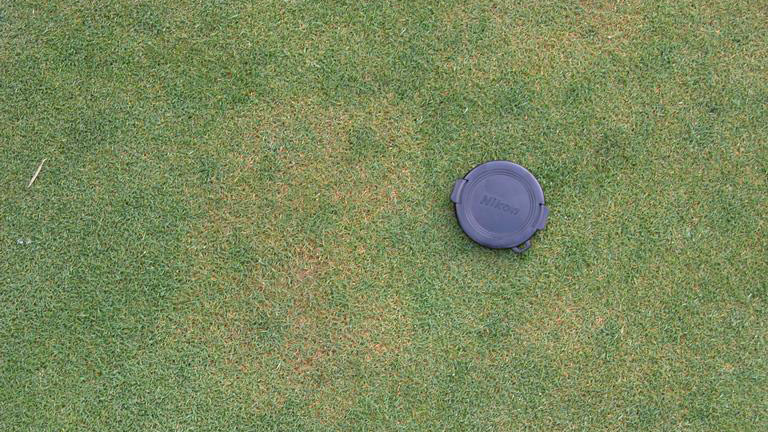 Pythium root dysfunction infects creeping bentgrass roots in the fall, winter, and spring when mean daily soil temperatures are between 50ºF and 75ºF. 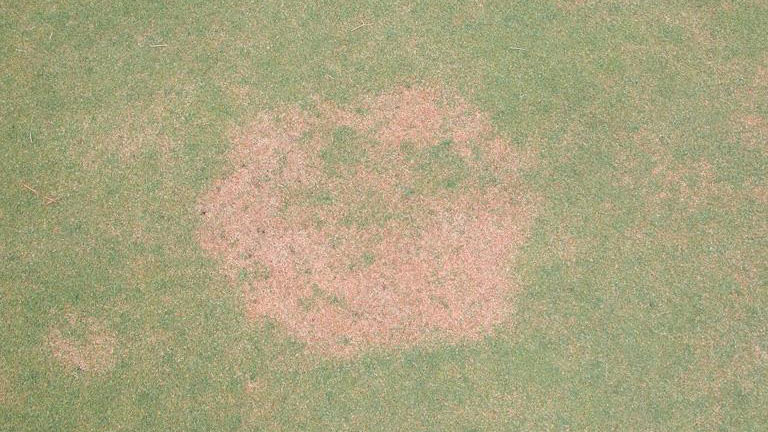 Disease activity reduces the turf’s ability to absorb water and nutrition from the soil, and also leads to rapid root dieback when soil temperatures exceed 85ºF. Therefore, the appearance of Pythium root dysfunction symptoms are enhanced by low fertility, drought stress, and low soil oxygen levels. Symptoms are most common during hot weather in summer but may also appear during warm, dry conditions in fall, winter, or spring. 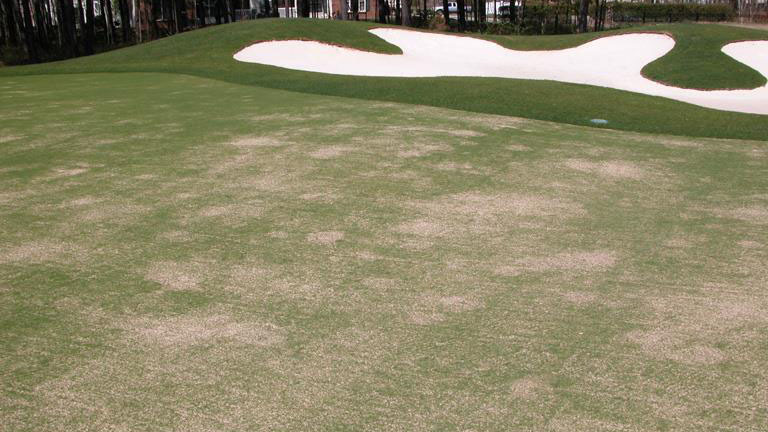 Creeping bentgrass greens should be constructed with at least 15% organic matter by volume to provide adequate water and nutrient holding capacity. After establishment, creeping bentgrass should be fertilized with 4 to 6 lbs. N per 1000 square feet annually. Use regular soil and tissue testing to ensure that all other nutrients are present in adequate amounts. Raise mowing heights above 0.125 in. during summer to increase photosynthesis and alleviate stress. Avoid severe drought stress by irrigating before symptoms of wilt become widespread, and supplement with syringing and hand-watering of areas that dry out more quickly. Soil surfactants increase the uniformity of soil moisture across putting greens and will assist with water management. Frequent cultivation and topdressing are needed to maximize oxygen levels in the soil. In general, 15% to 20% of the putting green surface area should be impacted by hollow-tine aerification annually, and 5000 lbs. of topdressing should be applied per 1000 square feet each year. Biweekly solid-tine aeration during summer will increase root survival by creating temporary channels for air and water movement through the soil profile. 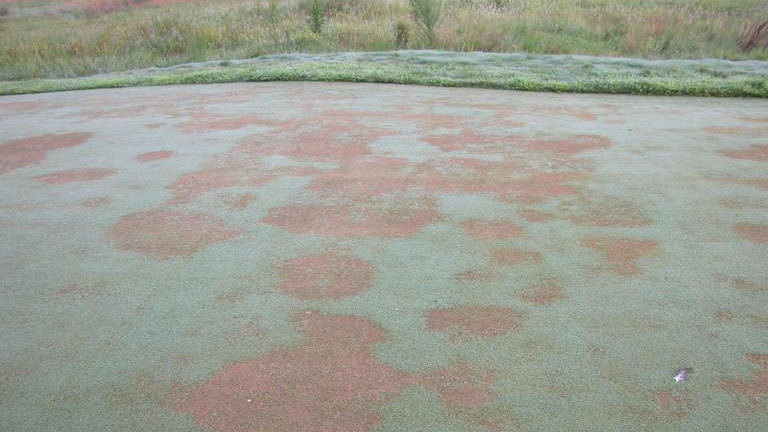 Standard Pythium fungicides, such as mefeanoxam (Subdue Maxx), propamocarb (Banol), and fosetyl-Al (Signature) have provided poor to moderate control of Pythium root dysfunction when applied alone. The most effective fungicides have been those belonging to the QoI (azoxystrobin, fluoxastrobin and pyraclostrobin) and QiI (cyazofamid) chemical classes. Applications watered in with 1⁄8 inch of irrigation immediately have been slightly more effective than standard foliar applications. The same result may also be obtained by making the applications in larger volumes of water (4 to 6 gallons per 1000 square feet) to drive the fungicide deeper into the canopy. Tank-mixtures of Signature + Banol (4 + 2 oz/1000 square feet) or Signature + Subdue Maxx (4 + 1 oz/1000 square feet) also have provided good disease suppression. These tank-mixtures are most effective when applied to the foliage in 2 gallons of water per 1000 square feet. 3. Signature + Banol (4 + 2 oz/1000 square feet) or Signature + Subdue Maxx (4 + 1 oz/1000 square) applied in 2 gallons/1000 sqare feet and left on the foliage. For preventative control, one of these treatments should be applied every 21 to 28 days in the fall and spring when mean daily soil temperatures are between 50 and 75ºF. Curative applications should be made every 14 to 28 days based on the appearance of symptoms. 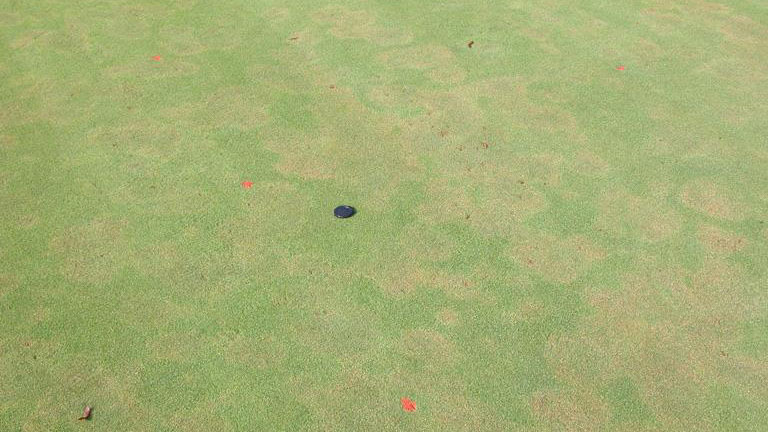 For curative applications, Insignia has been significantly more effective than the other QoI fungicides. Segway (cyazofamid) is also an effective curative treatment. Regardless of which fungicide is applied, effective curative control also requires increased mowing heights and nitrogen inputs to relieve stress and allow the affected plants to heal. Figure 1. Pythium root dysfunction stand symptoms. Figure 2. Pythium root dysfunction stand symptoms. Figure 3. Pythium root dysfunction stand symptoms. Figure 4. Pythium root dysfunction stand symptoms. Figure 5. Pythium root dysfunction stand symptoms. Figure 6. Pythium root dysfunction stand symptoms. Figure 7. Pythium root dysfunction stand symptoms. Figure 8. Pythium root dysfunction stand symptoms. Figure 9. Pythium root dysfunction root / crown symptoms.